Topics: State Branches, Qld Branch, & Events. 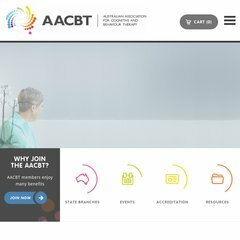 aacbt.org NATIONAL CONFERENCE - Australian Association for Cognitive ..
aacbt.org NATIONAL AWARDS - Australian Association for Cognitive Behaviour ..
aacbt.org Member Application - Australian Association for Cognitive .. The site has about 42 users daily, viewing on average 3.00 pages each. The programming language environment is PHP/5.1.6. It has 2 DNS records, ns1.gtp.com.au, & ns0.gtp.com.au. It is hosted by 45ru Pty Ltd. Internet Service Provider Perth Western Australia (Western Australia, Perth,) using Apache/2 web server. PING www. (203.82.212.50) 56(84) bytes of data. A ping to the server is timed at 268 ms.